One thing I’ve always wanted? A world travel map with push pins marking all of the places our family has visited. 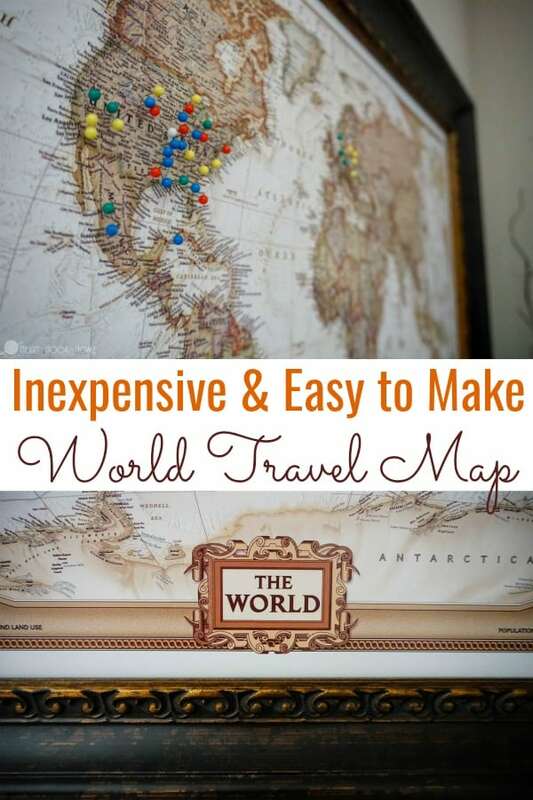 Instead of buying an expensive ready-made world travel map (partly because I know exactly what I want and partly because I know I can make it cheaper) I decided to make our own! 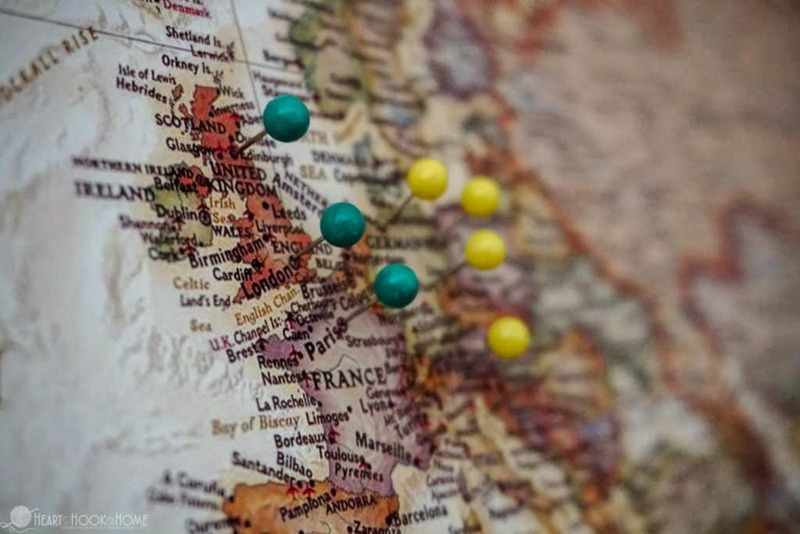 Make your own push pin travel map using the following tutorial as your guide. See what I did there? Ha! 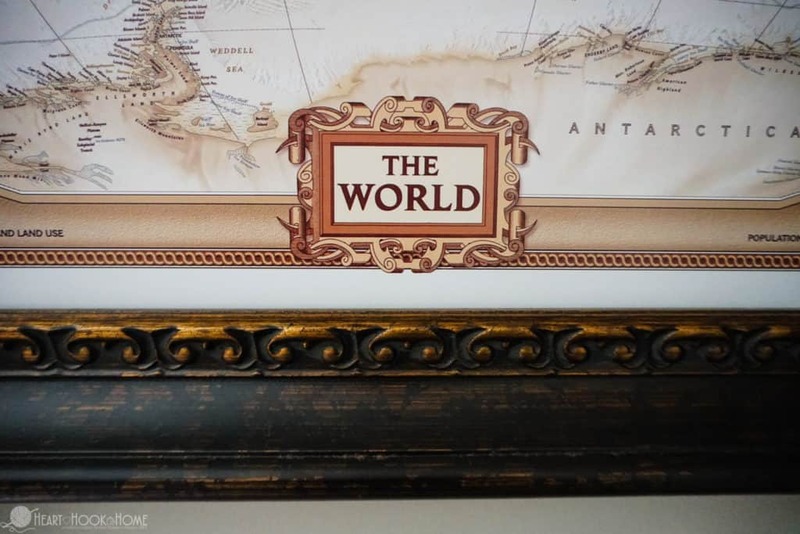 To make a travel map you’ll need the map itself, cork board (preferably 1/2″ thick), push pins, adhesive, and a frame. Or not! Unframed would be great too! I found an eerily similar version of the map we made online and it is over DOUBLE the amount we spent on the supplies to make our own. I also like that we were able to hand-pick the frame. Tell me this doesn’t look almost identical! *this is the exact one we used, inexpensive too! 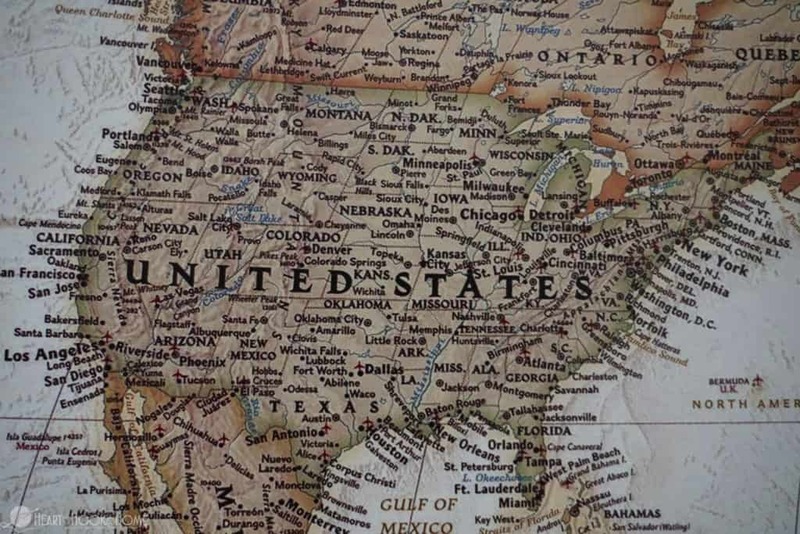 If you decide to go with a map other than the cost effective 24″ x 36” map here, make sure to read HOW they are going to ship it. 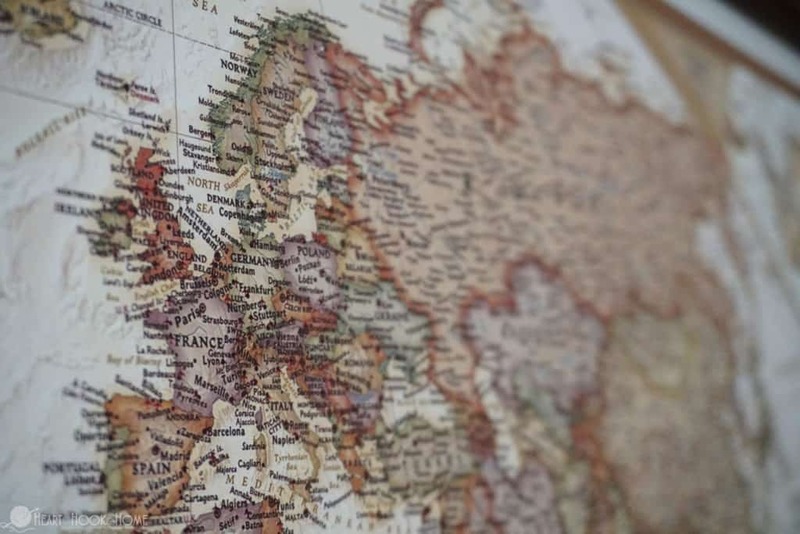 Some maps come folded and some come rolled. Definitely get the rolled. Now we did go with a fancier, $70 frame, but since we weren’t exactly in a rush to complete the project (had it been a gift it may have been a different story) we waited until it was 50% off at our local craft store and got it for $35! There were cheaper options still, but we wanted a little pizzazz. The frame was the most expensive part of the project but it makes it, I think! Michaels frequently has frames on sale and Hobby Lobby always has them on sale. Working on a large, flat surface, carefully unroll map on cork board, map side facing up. Line up all edges and place some heavy books on one end to keep the whole thing from curling/moving. Carefully lift opposite end of map and spray adhesive on center of cork board, gently smoothing the map from the center out so that there are no bubbles. Work your way incrementally to the outer edges of the cork board, smoothing as you go. When entire map is secured to cork board, flip the project so that the weight of the board forces the map to dry as flat as possible. Stack some books or other heavy objects on top to keep the pressure strong. We let ours dry overnight but I doubt that’s necessary. 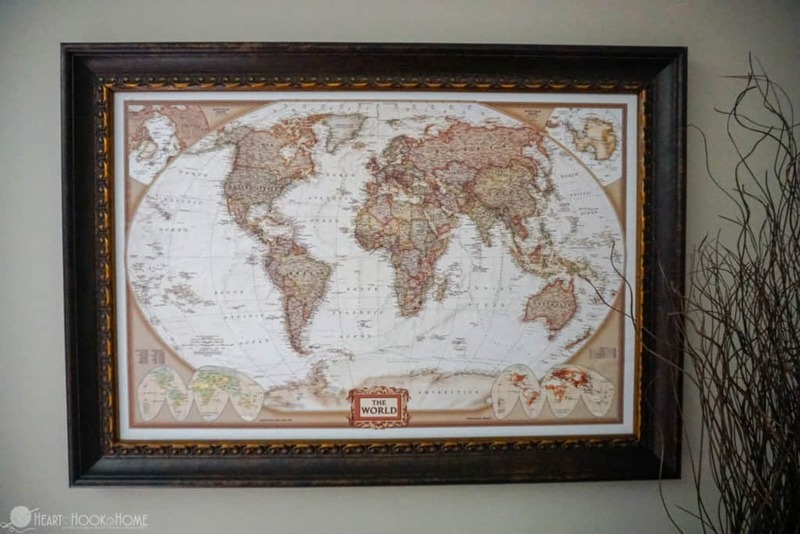 Next you’ll frame the cork board – or not, up to you! Since it wedged into the frame fairly tightly, we just secured the back with duct tape. Plain ol’ duct tape. Attach two picture hangers and you’re all set! The total size after framing is about 27″ tall and 40” wide – great size! We’ve got a total of about $60 in our project here, and if we had gone with a less blingy frame it would have been closer to $35. 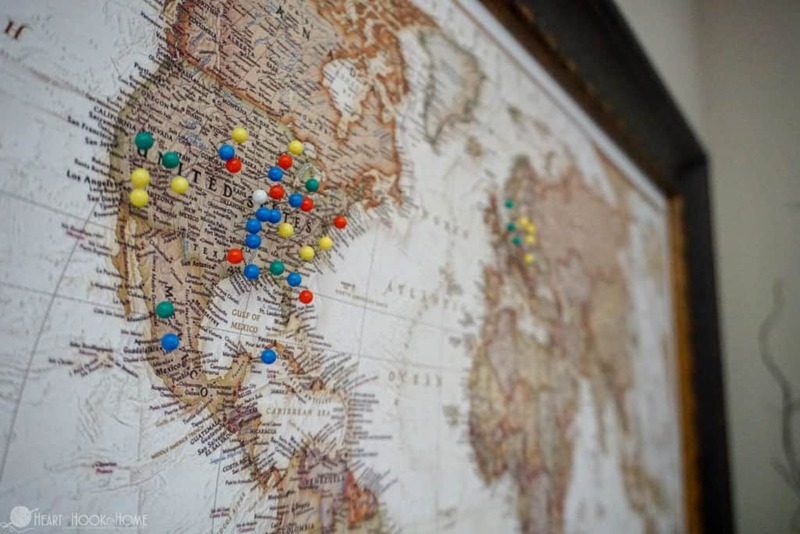 Use your map pins to mark where all you have been individually, as a couple, and/or as a family. We have five colors on ours; white is home, yellow pins are mine, blue pins are my husband’s, red pins are where we have gone as a family, and the green pins are where my husband and I have gone alone. I am so excited to keep adding to the map! My sister and I are headed to Germany in a few weeks (I’m going to do a Facebook live video or two while we’re there!) and then we are headed on a family trip to Amsterdam and Belgium over Christmas break. We had a family meeting and all agreed that we would rather go somewhere new and exciting than get a few new electronics or toys and clothes for Christmas this year. So, we waited for a super cheap flight alert to come through and booked right away. Christmas shopping done! The boys are so excited to get to go somewhere “cool” with us and I can’t wait for the experience myself!